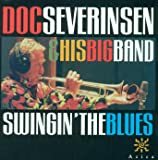 Listening to this or any recording by Doc Severinsen, you almost wish he would come close to playing a clam, or getting himself into a prickly situation before getting out of it with the usual flawless, consummate execution. It's ironical that the most visible trumpet player not to mention musical personality in America for approximately 30 years, is rarely if ever mentioned in a jazz magazine or even in discussions of big bands. And his recordings, for the most part, are on independent or self-produced labels and go unreviewed. It seems that if Doc has an inimitable, immediately identifiable "voice" on the horn it's simply his unfailing perfection. If you hear a trumpet characterized by a full and brilliant tone, a formidable range yet so consistent that the highs sound as "natural" as the lows, complete technical facility with regard to articulations, slurs and glissandos, control of rhythms, ability to play fast or slow--in other words, a trumpeter so flawless and assured you can "bank" on it, it's probably Doc Severinsen. His professionalism has won him the respect of all players of the horn but little attention from record collectors and followers of the jazz scene past and present. Certainly he can improvise--perhaps not the bebop of Dizzy Gillespie and Clifford Brown-- but enough to establish his credentials in that area or at least to demonstrate a willingness to take on risk. One wishes he had looked more to a leader like Woody Herman as a model of heading an ensemble of hungry young players and entertaining while presenting the art of jazz at its best if not staying at the forefront of the jazz mainstream. Doc was more likely to take his trumpet and wardrobe on the road with a group composed of rock guitarists, synthesizers, dancing girls and boogie rhythms if, as was the case in the disco seventies, those were the sounds of the day. At least listeners may rest assured that this recording captures him and the Tonight Show big band at its best. Guest trumpeter Wynton Marsalis adds little to the proceedings, though Tony Bennett is a plus on a Doc-fueled "I Can't Get Started," and fans of an all-time American favorite, "St. Louis Blues," will be more than a little pleased to hear the sterling arrangement and treatment it receives from Doc on this disc. As for the "feeling" advertised in the title, it ain't exactly "soul," but there's no denying our feeling of admiration for someone who takes the impossible and makes it all look so easy. If This were just Doc Severinsen and any old band this would be a great record. This is the Tonight show band,one of the tightest bands you will ever hear. Are you kidding me? this is one of the greatest bands in the history of music.Just look at some of the guys.Tommy Newsome,Pete Christlieb, Snooky Young,Conte Candoli,Ross Tomkins,Ed Shaughnessy.It reads like a jazz Hall Of Fame.Then,leading is Doc,one of the greatest to ever pick up a trumpet.If you like jazz,or big band or just great music.I urge you to get any of Doc's records with the tonight show band. 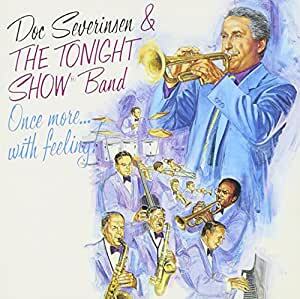 This is the third CD of music from 'Doc Severinson and the Tonight Show Band'. All three CD's that I now have are excellent for Big Band music fans! The band members are the best musicians, the leadership is superb, the arrangements are stellar and the performances are great enough to hear over and over again. This third collection/performance is in many ways the best of the three, as it shows more polish and thoughtfulness in the selection, arranging and execution on the part of every band member. I wonder if they thought this might be the 'last' of the series and "..let's make it the best.." prevailed. Hope you get to hear all three and enjoy them as I do. CD arrived in excellent 'LIKE NEW' condition. Inserts were excellent. It arrived timely. Now A WORD ABOUT USED cdS: Long ago I was hesitant in buying 'used' CDs, but I have had only 1 CD that was bad and it was not the seller's fault - it was caused by a chemical break down of the CD itself. I have purchased 100s of CDs over the years and only one bad one. Minor scuffs are usually okay. Sellers rate their CDs on the lower end of the scale to avoid 'mis-advertising'. It is the deep cuts and gouges into the lower layers of the CD that cause the damages to a CD's playability. Trust this seller. 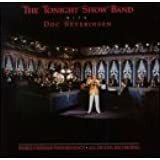 5つ星のうち5.0Doc and The Tonight Show Band were the real deal! 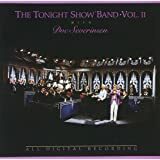 I am just now discovering these '80's Tonight Show Band recordings and WOW! This was such a great band and Doc was highly underrated. Arrangements here are by the legendary Bill Holman and members of the band. Tommy Newsome was a terrific arranger. There's a lot of trumpet here, but Doc is very gracious and some songs are almost all sax. The soloists are all strong.